I'll confirm my nerdy status by admitting I like to visit libraries on vacation. The cool part about the Cleveland Library is that it's also like touring a beautiful historic home--for free! According to my historic downtown guide, the Jarnagin House was originally built in 1883 by the founder of the Hardwick Stove Company. 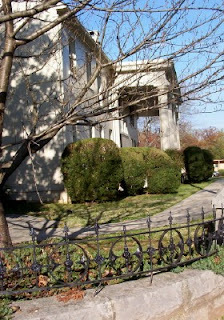 In 2001, the city added 5,000 square feet to its rear in what I considered a graceful expansion. 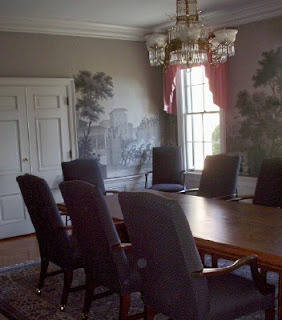 The original dining room became an elegant conference room. A helpful library staffer pointed out a few details in the front parlors--now offices. 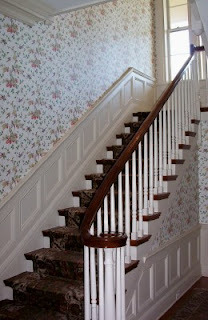 We walked through a beautifully paneled hallway and admired the bird-patterned stairwell. So full of light! When we reached the rear addition, we noticed a lending puzzle library. 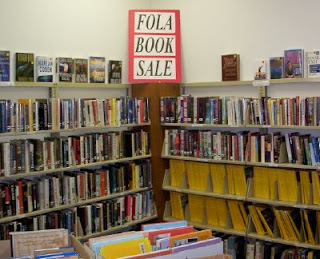 Then, a permanent corner devoted to the Friends Of The Library book sale! Great timing. I picked up several fresh Country Livings for the ride home. I'm so glad I'm not the only one who thinks libraries are vacation material:) This one looks lovely! What a great idea to have a lending puzzle library!